The lonely sentinel of the Monasterboice ruins rises above a patchwork of green fields where Holsteins lazily graze. The rounded tower, which at 28 metres is one of the tallest in Ireland, was built more than a thousand years ago and is still in remarkably good shape despite a Viking takeover in 968 and a devastating fire in 1097. Located in County Louth near the town of Drogheda, the site was founded in the fifth century likely under the leadership of St. Buithe, a disciple of the St. Patrick. 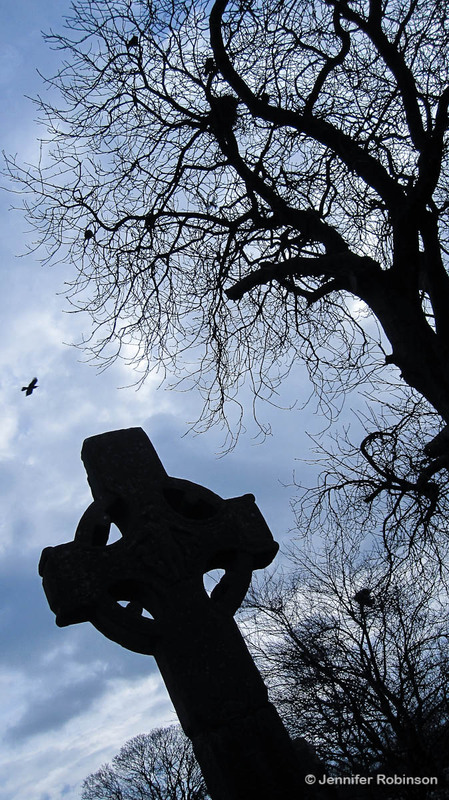 Today, Monasterboice remains a hauntingly spiritual and peaceful place with only the sound of the wind, the lowing of cattle and the cries of birds pinwheeling ‘round the tower breaking the silence. Admission is free to Monasterboice, which can be easily found off the M1 highway on the way from Dublin to Northern Ireland. For directions to the site, click here. It’s a great stop to break up the trip and is one of the best spots I visited in Ireland where you can experience history from the Dark Ages first hand. 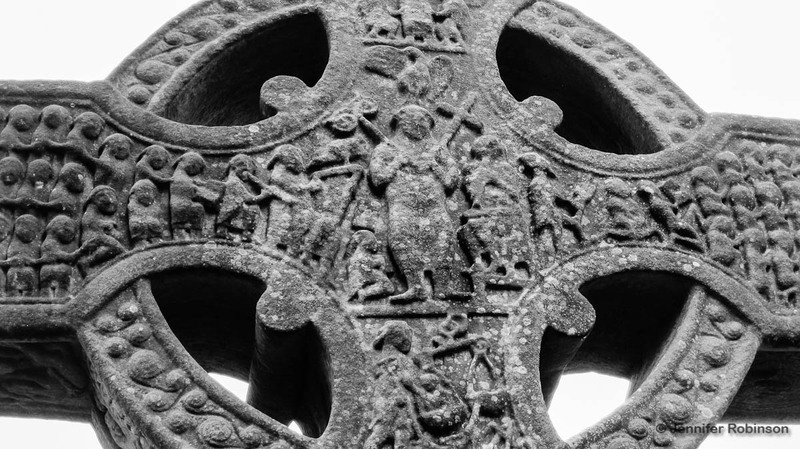 It is often forgotten — though the Irish do like to remind us — that Ireland and its Christian monasteries were one of the few bright spots during the period after the collapse of the Roman Empire. It is ancient sites like Monasterboice where Irish artisans, writers, scholars and monks kept knowledge and learning alive for all of us despite the threat of savage Viking attacks. 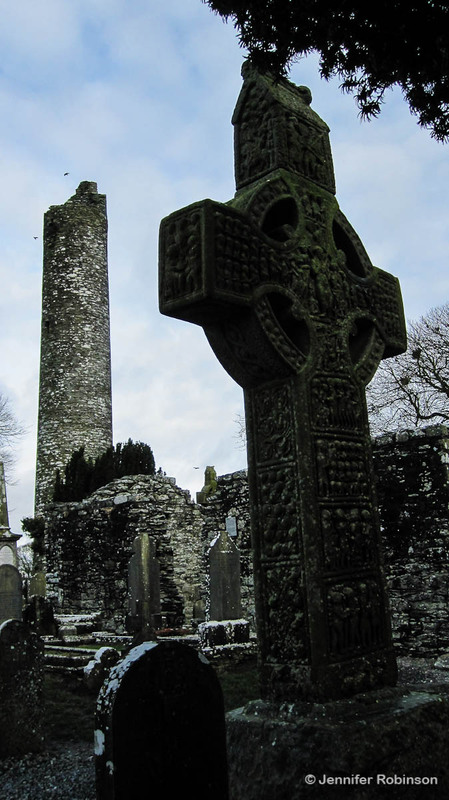 In fact, Monasterboice did fall under Viking rule for a brief spell. They were later resoundingly trounced by Donal, the Irish high king at Tara. Visitors are able to mill around the small site to their heart’s content but entrance to the tower, which is missing its top cap, is forbidden. I visited the site in mid-morning with my friend Alicia. I can only imagine how spooky it would be by moonlight, especially all alone. 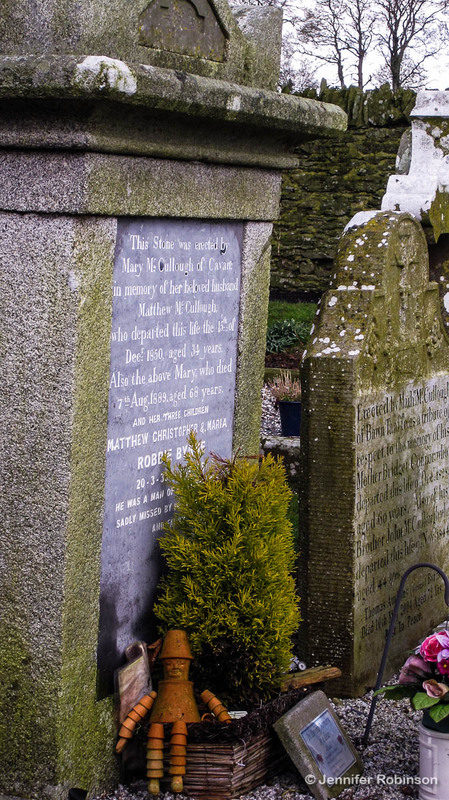 By day, it is a charming little graveyard and like many other ancient burial sites in Ireland, it also contains the graves of those who have more recently passed. Take for example, the well tended final resting place of Matthew McCullough, beloved husband of Mary, who died in 1850 at the age of 34. It’s fascinating to see all the generations, hundreds of years apart, buried together in one spot. In addition to the tower, the monastic ruins also feature giant Celtic crosses erected in the ninth and 10th centuries and church ruins. The first cross visitors will encounter upon entering the site is Muirdeach’s Cross, named after an abbot who oversaw Monasterboice until his death in 922. Weathered panels on the massive cross, which stands more than five metres tall, feature scenes of Christ’s life and crucifixion, as well as Adam and Eve and the murder of Abel by Cain. For more information on the individual panels, click here. The West Cross, which at 6.5 metres is the tallest in Ireland, is located near the round tower. Although not as old as Muirdeach’s, the religious panels on this cross have not fared as well and are harder to decipher. 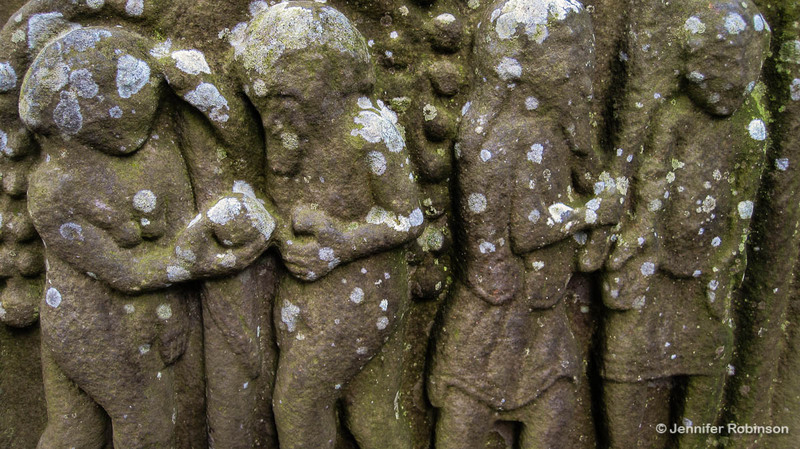 For almost 700 years, Monasterboice was an important religious centre. It fell into decline when the nearby Mellifont Abbey was built in 1142. Hello Jennifer, I am the grandson of Robbie Byrne whos name is at the bottom of the McCullough grave stone, you are right this is a family plot and it is nice to see it on here, thank you. Great shots. This post reminds me of the time i went to Iona Abbey in Scotland. I haven’t been there yet. I’ve only seen Scotland from across the waves in Northern Ireland. And thank you for your kind words!